Proposals for repairs to a major interchange in Duluth were open to public comment through Dec. 11 via an online survey from the Minnesota Department of Transportation. 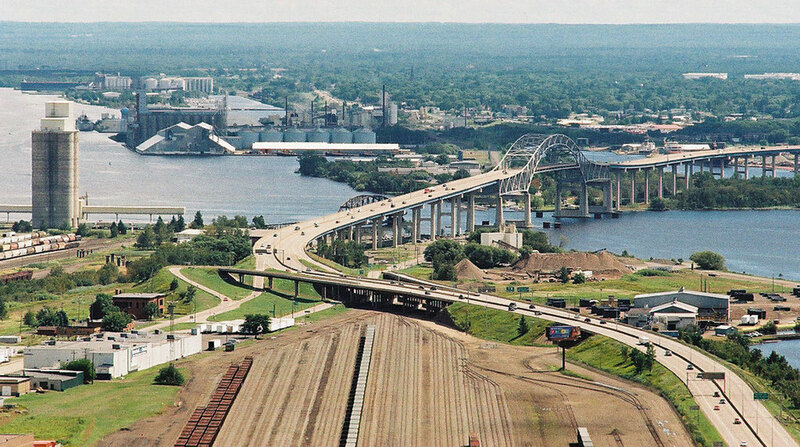 The project will redesign the interchange that links Interstate 35, I-535 and U.S. Route 53 — colloquially known as the “Can of Worms” — which connects to bridges that stretch to Superior, Wis., and abuts the Port of Duluth-Superior. The port handles 35 million short tons of cargo annually. The interchange, which is over 50 years old, has exceeded its prime, agency spokeswoman Beth Petrowske said. The new one will be able to accommodate oversize and overweight loads, something the current setup can manage in only limited capacity, and will relocate all ramps to the right side of the roadway. “That is going to greatly facilitate freight movement,” Petrowske said. “It will help tremendously with freight movement.” According to MnDOT, some 3,450 heavy commercial loads move through the interchange every day. Construction on the $204-million project is scheduled to stretch from 2019 through 2022. MnDOT’s survey accepted comments on four potential blueprints — Concepts B, C, I and O — that the department is weighing. MnDOT Project Manager Roberta Dwyer said the agency is also vetting these options through a series of public meetings, and hopes to make a selection by the spring. Halvor Lines Chief Strategy Officer Carl Svendsen said safety and increased mobility from the port to the interchange are what he is looking for in the reconstruction. Based in Superior, Halvor Lines is a trucking and logistics company with about 500 drivers. Two bridges link Duluth to Superior. The Blatnik Bridge carries I-535 and U.S. Highway 53, while the Bong Bridge carries U.S. Route 2 and connects with I-35 in Duluth. The Blatnik Bridge extends from the Port of Duluth-Superior, whose Clure Public Terminal offers links to rail, freight and waterway travel. Svendsen said freight movement would benefit from increased connection points for trucks leaving the terminal. Currently, trucks exiting the terminal and connecting to I-35 must backtrack, get on a ramp for I-535 and then connect to I-35. Svendsen prefers Concept I because it includes wide-radius turns and offers a fairly straight shot from I-535 to U.S. 53, a route that crosses I-35, ascends a steep gradient and eventually leads to the state’s iron range. Concept I also features a bridge going over the railyard near the Clure terminal, rather than a road going through it. Svendsen acknowledged that, depending on how MnDOT closes the routes during construction, some traffic may be diverted through downtown Superior. The Blatnik and Bong Bridges are two of the 33 bridges involved with this project. According to Dwyer, many are structurally deficient and cannot manage overweight loads. Plus, a number of the bridges are non-redundant, she said, meaning they’re supported by one main member, and that closures for repair occur every few years. MnDOT plans to replace all 33 structures.